I won't mention the particular ones, but there are some television shows and characters that my kids like that make me cringe. Even though they clamor to watch them, it's hard for me to be okay with some of the words or actions that are displayed. My children are quite impressionable, after all! 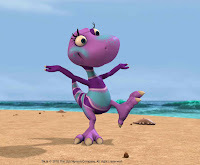 However, one of the newest additions to the lineup at PBS KIDS (our favorite channel) that our whole family has been enjoying is none other than the fun and educational Dinosaur Train. 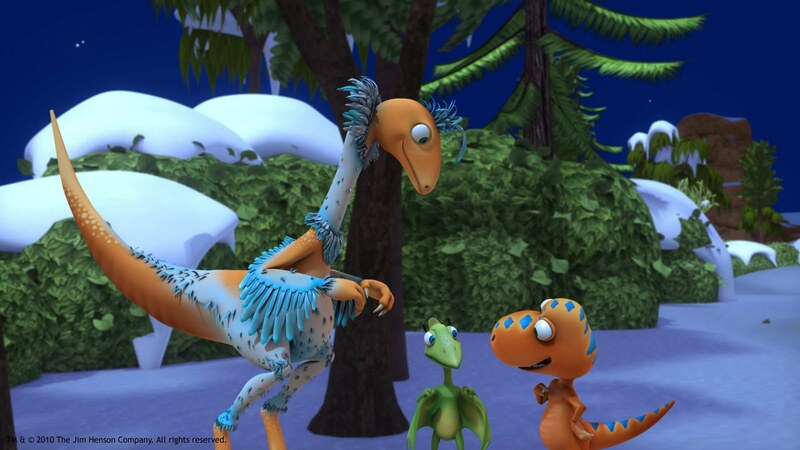 In Dinosaur Train, young viewers join Buddy and his adoptive family of Pteranodons on whimsical adventures through prehistoric jungles, swamps, volcanoes and oceans as they unearth basic concepts in natural science, natural history and paleontology. I have learned quite a bit just by watching with my kids! The Dinosaur Train itself is a colorful locomotive, customized to accommodate all kinds of dinosaurs, and it has the ability to visit the Triassic, Jurassic and Cretaceous worlds. The Train's Conductor, a knowledgeable Troodon, provides passengers with fascinating facts along the way in their journeys. Created by Craig Bartlett (of Hey Arnold! 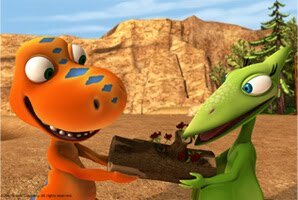 ), Dinosaur Train embraces and celebrates the fascination that preschoolers have with both dinosaurs and trains while encouraging basic scientific thinking and skills. Each episode includes animated segments with live-action sequences featuring a paleontologist who brings to life the show's natural science and natural history curriculum and gives specific facts about dinosaurs and compares their features to animals of today. 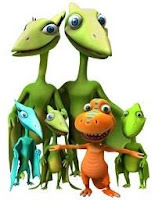 Considering how much my kids like Dinosaur Train, I'm not surprised that it is a Parents' Choice Recommended TV series and that their website received a Parents' Choice Silver Award and was the recipient of a prestigious 2010 Prix Jeunesse Award. In addition, their interactive website gives children a fun way to discover natural history and the science of paleontology through many games and activities. As well as the engaging content, printables, games and dinosaur field guide at the Dinosaur Train PBS KIDS website, there is also a Dinosaur Train geocache program that encourages families to get out and discover treasures together. What a fun way for kids to explore their surroundings, use their observational skills and have their own adventure right in their neighborhood! 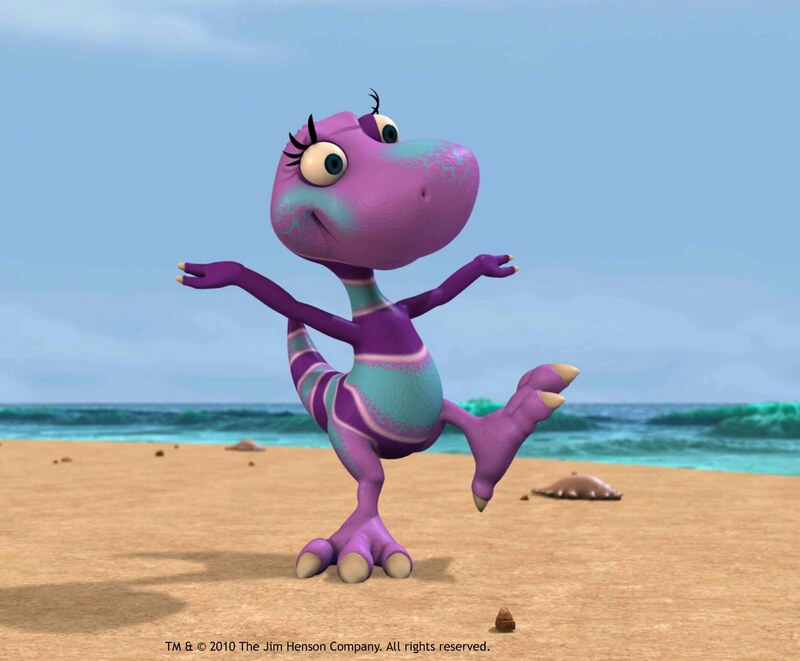 So, is there a Dinosaur Train fan in your life? They'll be excited to know that an all new episode is premiering today, December 6, right on PBS KIDS! In Big Stomping Dinosaur Feet Daphne, a Daspletosaurus, shows Buddy how to make stomping a fun dance instead of a temper tantrum. In Hornucopia at the Big Pond Tank introduces the Pteranodon family to his friend, Stacie Styracosaurus, a fellow Ceratopsian with a crown of elaborate horns on her head. Finally, in Cretaceous Conifers, Buddy travels to the North Pole to explore nocturnal animals and becomes a detective while celebrating his birthday and more. Encore presentations of this episode will broadcast on December 8, 12, 20 and 24 (check your local listings) and is one of eight fun adventures on the Dinosaurs in the Snow DVD that PBS KIDS has released as well! To enter to win: Tell me who the lucky recipient of this DVD would be and why they would love it! 1 Extra Entry (per method) if you follow PBS KIDS on Twitter and/or Like them on Facebook. 3 Extra Entries if you blog about this giveaway linking back to Thanks, Mail Carrier and PBS KIDS Dinosaur Train. 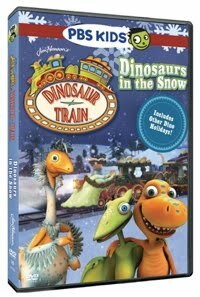 A big thank you to PBS Kids for providing a Dinosaurs in the Snow DVD for one lucky giveaway winner. The opinions shared are my own and honest and if you really need to see more, click here to see how I roll. I would love to win this for my daughter! She loves to watch Dinosaur Train! My nephew would love this! I watch him while his mother works and we watch Dinosaur Train everyday!! I'd love to win this for my daughter, she is a huge dinosaur train fan! This show has opened up her love dinosaurs! My nephew would get this, he loves dinosaurs. I would love to win this for my son, he loves Dinosaur train, watches it on PBS kids and Netflix! I know a certain little 4 year old boy that would love this:). definitely, my son! he loves this show, (and i do, too) and we don't have TV, so it would be great to own the DVD. My son would love this as he tells me he is going to be a palentologist when he grows up! I would give this DVD to my 2 1/2 year old grand daughter, who loves the Dinosaur show. It would go to my two boys! They LOVE DT...I only let them watch PBS...the others make me cringe, too! Entered the Kolcraft Jeep giveaway! My 3 year old grandson is beside himself when he sees dinosaurs, He'd love this. Thanks for the wonderful giveaway. My son would love it because he loves the show. My son Major would LOVEOVEVEVEVEVE this!!!! My son absolutely loves Dinosaur Train, it was on of the first cartoons he actually got into. Everytime we see buddy or tiny anywhere he gets a big smile on his face. It would be for my son who loves Dinosaur Train! I also entered the Squiggle contest. I would love to win this for my son! He watches daily! My daughter would love this! She watches a lot of mornings while I get ready. This will be for my daughter who looooooves dinosaurs! I'd give this to my kids, both big Dinosaurs enthusiasts! i would win this for my little blue she loves this show. entered green party goods giveaway. follow you on twitter and tweeted about giveaway.. I'd give it to my daughter - she loves to watch Dinosaur Train on PBS! The Lucky little one who would receive this DVD would be my nephew. My son Evan would LOVE this DVD! If I won, this would go to my dino-obsessed three-year-old. This would be for my boys because they LOVE dinosaur train! I like pbs kids on facebook. My son would be the receipient and he would love it b/c he is so into dinos! My son Vance loves Dinosaur Train. I hear, "Can I watch Dinosaur Twain," at least twenty times a day. He would be so excited! 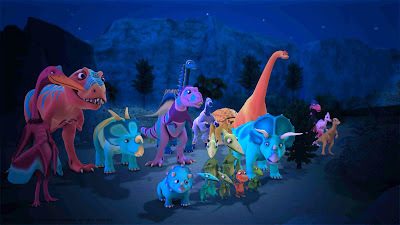 My daughter loves Dinosaur Train so she would be the one getting it! My youngest grandson would get this. He loves watching Dinosaur Train; and I don't mind watching with him. My four-year-old son, Bradford, would get this, and he would love it because he is sick of watching his sister's "girly" movies, and would like some boy-centered stuff to watch for a change. I absolutely love this show! I was watching it with my little cousin who is 4 the other day and thought it was the cutest thing ever! If I won, he would be the lucky one to receive it! Thanks for the chance! I follow PBS Kids on Twitter from @Polopony95! I entered the Build A Bear contest!